Driven by the top of the market, the first four juvenile sales of 2017 resulted in a 12.2% increase in gross receipts, a 15.8% cumulative increase in average, and a decline in buy-backs as the marketplace becomes more polarized. 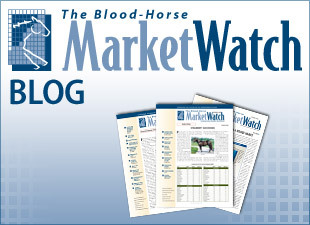 According to BloodHorse MarketWatch data, the Fasig-Tipton Gulfstream, Ocala Breeders' Sales Co.'s March sale, and April auctions conducted by Barretts in California and the Texas Thoroughbred Association have combined for $90.4 million in sales, with 489 horses sold, compared with $78.2 million for 429 sold at the four auctions in 2016. The 169 not sold this year from 658 offered represents a 25.7% buy-back rate; last year, the RNA rate was 27.7% as 165 of the 594 through the ring went unsold for the first four 2-year-old sales. A breakdown by price deciles shows 47 horses sold for $500,000 or above this year, with only three RNAs in that price range. By comparison, there were 28 such transactions during the first four juvenile sales of 2016, with three buy-backs at that level. The $36.7 million grossed by the juveniles sold at the top of the market represents 40.5% of gross receipts for the four auctions, compared with $21.4 million, or 27.3% of the total, at the same juncture a year ago. There have been eight horses sold in excess of seven figures, compared with six a year ago. At the other end, of 382 offered within the sold or bought-back price range up to $99,999, the 136 that did not sell represented a 35.6% RNA rate. Last year, 113, or 39.6% of the 285 lower-end horses, were bought back. Bloodstock agent Pete Bradley, who is active as a buyer and seller at major 2-year-olds in training sales, said the top of the market is being driven by an infusion of new buyers. He estimated seven or eight newcomers, either acting on their own behalf or through agents, have impacted the upper end so far this year. "That is a huge influx of new people into a market as small as we have," he said. Bradley said it's not surprising the RNA rate would be much higher for less expensive horses than those at the top. Consignors with better quality horses are more inclined to withdraw their offerings rather than send them through the ring and buy them back when there is sufficient buyer interest. "When you have a high-priced yearling that you go to a 2-year-old sale with and it’s not getting vetted, it gets scratched," Bradley said. "The guys who play at that level say 'I'll take a shot and race it' so those horses are scratched more frequently than the cheaper horses. With cheaper horses you have the little guys—they are more reticent to race than to sell. So they have to run it through the ring even if I have one vet or zero vets on it."